GBC offers over 70 years experience in designing and producing top-quality shredders. GBC office shredders come with a complete three-years warranty (lifetime warranty on cutting heads), and GBC has the industry's only on-site factory service program plus hundreds of servicing dealers. 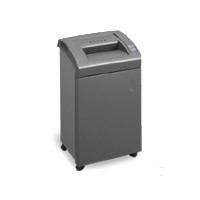 High security shredders are designed to shred sensitive and top secret documents. These paper shredders offer you the greatest degree of protection against information theft or misuse by reducing your private documents to mere confetti. Specifically designed, high security paper shredders comply with Department of Defense (DOD) standards making them perfect for the Military, Federal, State and Local Government Agencies, as well as Defense Contractors. These shredders feature continuous-duty motors that never need a cool down period. The exclusive Jam-Stopper Electronics provide Auto Stop on Jam to minimize motor wear and tear. Deep, funnel-shaped throat simplifies paper feeding by accommodating oversized sheets and disorganized stacks. An automatic on/off provides convenient one-handed operation. 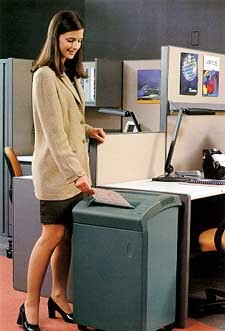 Large shred bins allow for long runs between bag changes and casters provide easy mobility.
" Ideal for high volume centralized use providing ultimate security in departments and copier areas." The GBC Shredmaster 5270M Micro Cut Office Shredder - 15" throat with deep, funnel shape. 4.92 cu. ft. (32 gal) shred bin and continuous-duty motor. SmartShred� visual indicators help keep the operator informed � Power On, Bag-Full, Overload and Door Ajar. Jam-Stopper® Electronics feature solid one piece cutting head, bag-full shut off, and auto stop on jam. Auto On/Off. Shred Size (Inches)� 3/32" x 19/32"